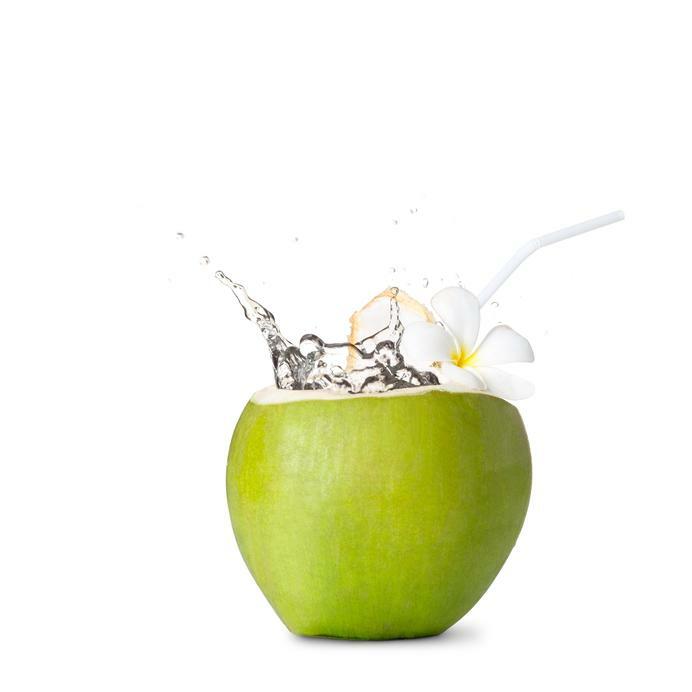 Coconut water is an amazing drink that has been increasing in popularity over the past few years. And it’s no wonder—the health benefits of coconut water are numerous. Why should you drink this natural product? 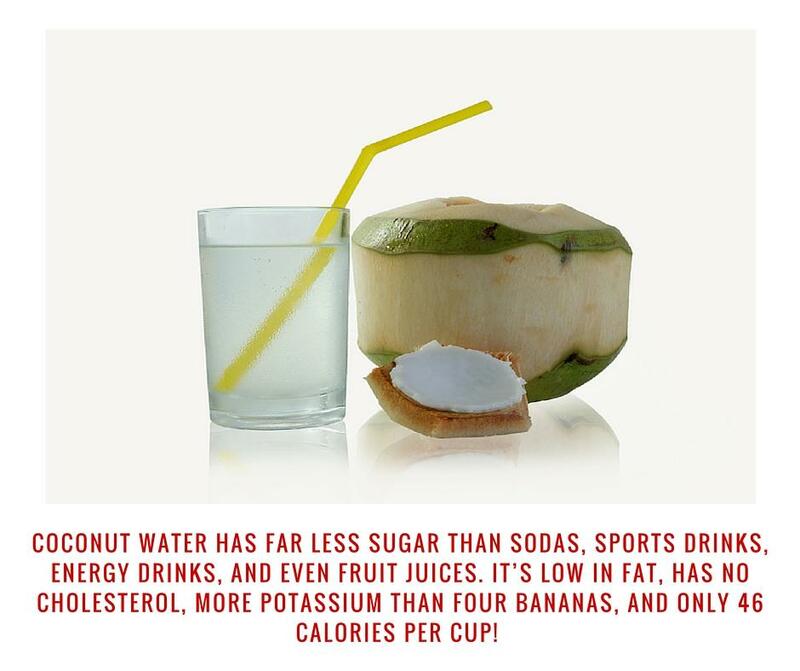 Because it has far less sugar than sodas, sports drinks, energy drinks, and even fruit juices, plus it’s low in fat, has no cholesterol, more potassium than four bananas, and only 46 calories per cup (by contrast, coconut milk has far more, at about 552 calories per cup).If you have high blood pressure, drinking coconut water may contribute to bringing those numbers down. Coconut water is mostly clear, though a bit foggy depending on how much of it has been filtered and processed by the manufacturer (if you’re buying it pre-packaged). 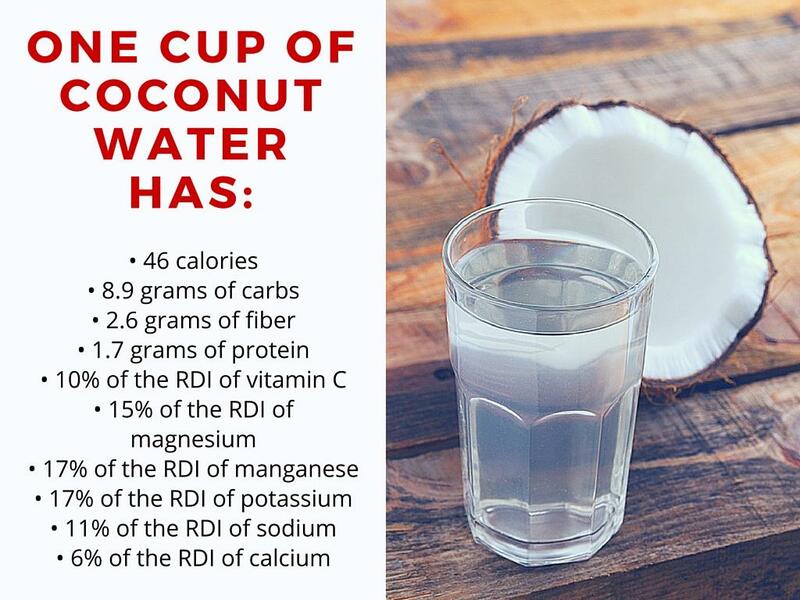 If you’re drinking it straight from the coconut itself, it will be clearer, like water. It has a mild aftertaste that can be objectionable to some and delightful to others, but overall it has a delicate flavor. When coconuts are harvested, they are done so between five and seven months (they’ll still be green). This is when the coconut will contain the most water, and said water will be at its most nutritious. Coconut water is more common in tropical countries because that’s where coconut trees grow. In fact, up until a few years ago, you would’ve been hard-pressed to find coconut water in the United States. Coconut milk was easier to find because it’s used in cooking. Who knows how these trends start, but this is one that should be considered because of the health benefits associated with coconut water. It’s been touted as nature’s sports drink because of its high electrolyte content, so if you can’t or don’t want to drink the sports drinks found in the supermarket this is a terrific alternative, especially when you consider that a typical sports drink bottle has over 42 grams of sugar—the daily recommended limit is 25 grams! 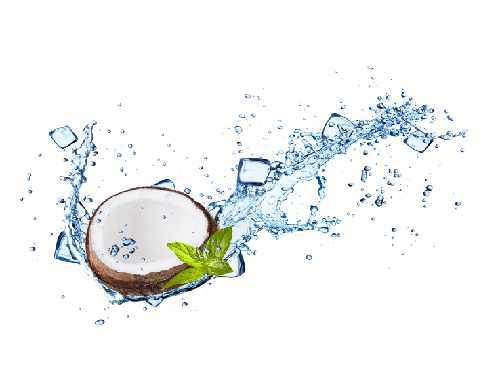 The health benefits of coconut water (1) come down to its nutritional profile; it’s sterile (so it’s sometimes used as an IV drip for electrolyte rebalancing) and made up of sugars, vitamins, minerals, electrolytes, enzymes, amino acids, cytokines, and phytohormones. Coconut water is low in calories, has lots of nutrients, and helps level blood sugar, as opposed to the spike-and-crash effect you get from sugary drinks. The health benefits of coconut water for weight loss can be quite substantial for those who regularly drink sugar-laden sodas or energy drinks. Coconut water is low in calories, has lots of nutrients, and helps level blood sugar, as opposed to the spike-and-crash effect you get from sugary drinks. Some companies do offer flavored coconut water, such as chocolate or coconut water mixed with light fruit juices, so there are options if you want something with a tad more flavor. Coconut water is used as a laxative and since it’s safe and gentle, it can be taken by pregnant women. The health benefits of coconut water during pregnancy could help moms-to-be with issues regarding constipation, which can happen to many pregnant women. In Ayurvedic medicine, coconut water is used as a laxative and since it’s safe and gentle, it can be taken by pregnant women without any concern for the fetus. In fact, it’s also been known to help ease feelings of nausea. Remember, coconut water is not the same as coconut milk. The water is the clear liquid you hear when you shake a coconut. Coconut milk is coconut water that has been blended with coconut meat (the white flesh that lines the husk of a coconut shell). 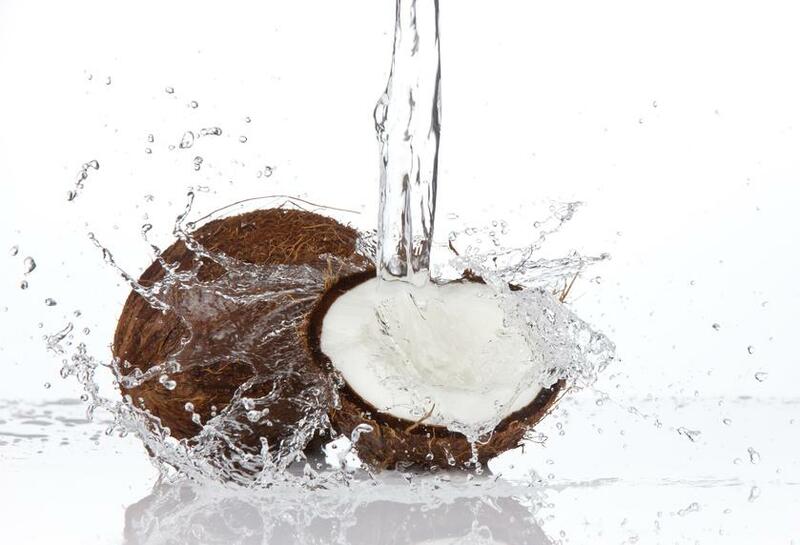 But don’t think that the water has all the nutrients—there are also health benefits in coconut meat, as it’s high in vitamins A and E, essential fatty acids, polyphenols, and phytosterols (2). As you get older, even a few drinks can bring on the dreaded hangover, making you feel sluggish, dehydrated and foggy, and giving you a world-class headache. The body is starving for proper hydration, and coconut water should be the first go-to remedy to solve those morning-after blues because it will replenish your electrolytes, helping you fight off the bad effects of alcohol. Make sure to have a few containers on hand for those just-in-case mornings! When the heart and blood vessels are exposed to oxidative stress, plaques develop in the arteries which can lead to high blood pressure, blockages, heart attacks, and strokes. Coconut water contains antioxidants that can decrease oxidative stress and benefit the heart. Potassium is known to reduce blood pressure, and coconut water is high in potassium. According to the Centers for Disease Control and Prevention, one in every three American adults (70 million) has high blood pressure. 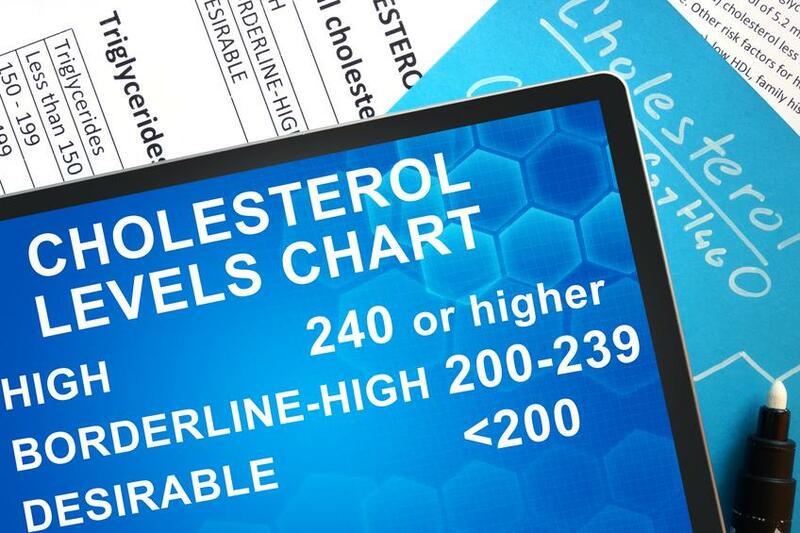 It’s critical to maintain a healthy blood pressure level, around 120/80. Potassium is known to reduce blood pressure, and coconut water is high in potassium. In a study published in the West Indian Medical Journal in 2005 (3), hypertensive subjects were given coconut water for two weeks. In that time it was observed that the participants had reductions in systolic and diastolic blood pressure measurements. Because it’s low in carbs and sodium, coconut water might not be an optimal choice for hydration after intense exercise. A study published in 2010 in the journal Medicine & Science in Sports & Exercise (4) shows that coconut water replenishes the fluids in the body as well as sports drinks. It also showed that hydration levels were better with coconut water than just plain water. As for taste, participants preferred sports drinks. 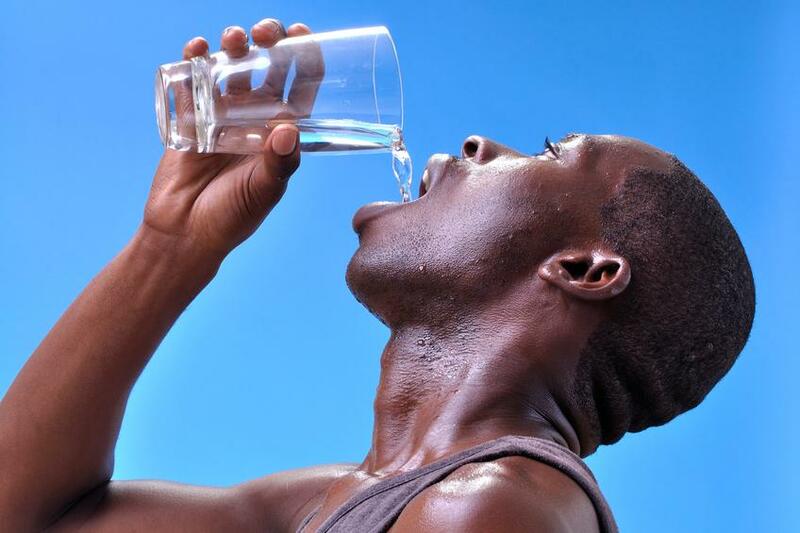 The study also suggests that because it’s low in carbs and sodium, coconut water might not be an optimal choice for hydration after intense exercise, and these levels deplete quickly and need to be restored. Coconut water has 15% of the daily recommended amounts of magnesium, so drinking it daily could potentially keep headaches at bay. When it comes to headaches and migraines, magnesium can be a big help; those who suffer from regular headaches often don’t have enough of this mineral in their diet. Coconut water has 15% of the daily recommended amounts of magnesium, so drinking it daily could potentially keep headaches at bay, or at the very least decrease their intensity. Make sure to buy water that has no added sugar, coloring, or flavorings, as these additives may trigger headaches. Potassium is required to keep the heart, brain, kidneys, muscle tissues, and other organ systems in optimal condition, and coconut water is rich in potassium. Potassium is the third most abundant mineral in our bodies, and is very important helping to keep many things in check, such as stroke risk, blood pressure, heart and kidney disorders, anxiety, and stress. It enhances muscle strength, improves metabolism, maintains the electrolyte level in the body, and calms the nervous system. Potassium is also required to keep the heart, brain, kidneys, muscle tissues, and other organ systems in optimal condition, and coconut water is rich in potassium. 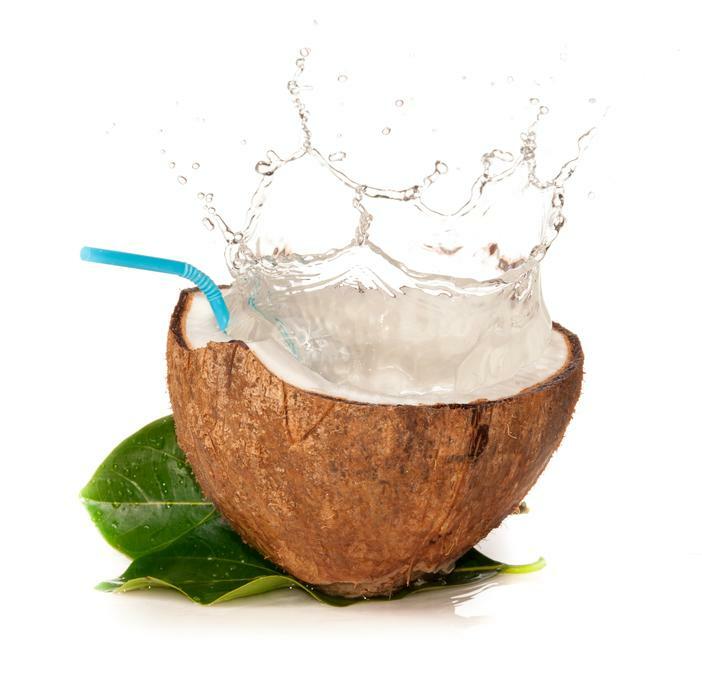 Drinking coconut water can potentially decrease LDL (“bad”) cholesterol levels. In an animal study published in the Journal of Medicinal Food in 2006 (5), attempted to determine how cholesterol levels were impacted by the consumption of coconut water. 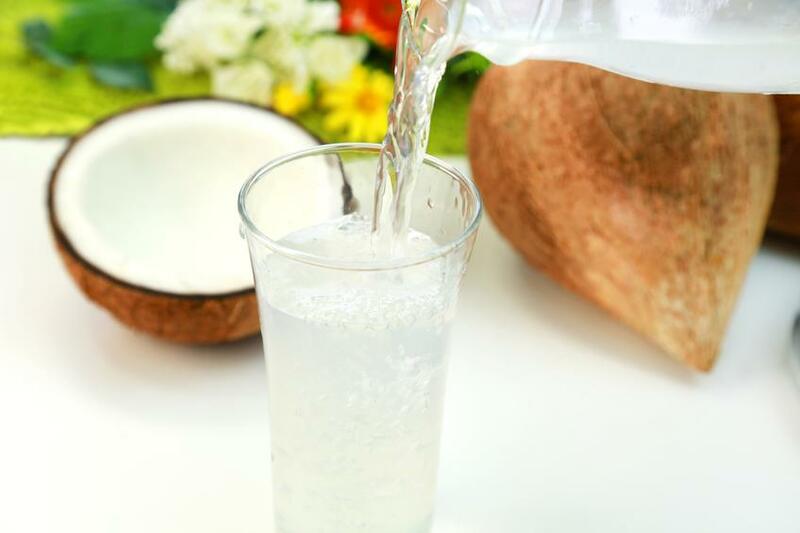 Researchers discovered that rats given coconut water (4 milliliters per 100 grams of body weight) showed a decrease in LDL (“bad”) cholesterol levels while HDL (“good”) cholesterol levels increased. Of concern with this study is the fact that the rats took in proportionally more coconut water than most people typically would, so scientists concluded that more long-term studies on humans were needed before any real conclusions could be made. Still, the results are promising. 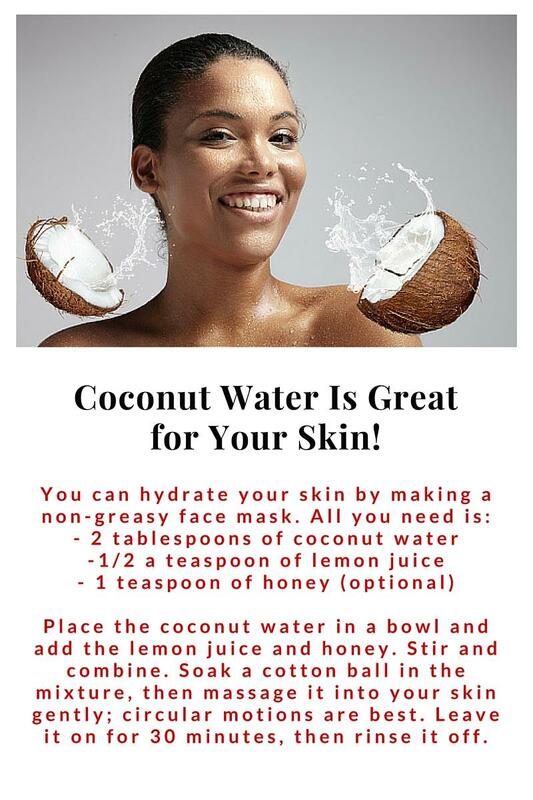 Did you know you can also use coconut water topically? You can hydrate your skin by making a non-greasy face mask with two tablespoons of coconut water and half a teaspoon of lemon juice. You can also add one teaspoon of honey, if you like. Place the coconut water in a bowl and add the lemon juice. (If your skin is particularly dry, you would add the honey as well.) Stir and combine. Soak a cotton ball in the mixture, then massage it into your skin gently; circular motions are best. Leave it on for 30 minutes, then rinse it off. There are other health benefits of coconut water for the skin. You can use it with yogurt to reduce the signs of aging and combine it with fuller’s earth to help reduce pigmentation. You can also use it plain to help treat skin infections and if you’re trying to reduce acne, add a little honey to coconut water. And don’t forget about health benefits of coconut milk! Coconut milk can be used in place of regular milk for cereal, smoothies, tea, and anywhere else. So be sure to drink up to reap the health benefits of coconut water and milk!